This super oat smoothie is a clean and healthy way to start the day. Made with oats, oat milk, and yogurt. Soak the oats in the oat milk overnight, or at least 30 minutes. This softens the oats. In the morning, Put everything in a blender and mix until smooth. 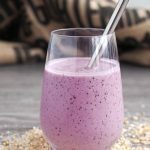 You can also make the smoothie without soaking the oats first, but I would recommend leaving the smoothie in the refrigerator for at least 30 minutes before drinking, to allow the oats to soften. The color of the smoothie will change as the banana browns though. Get this recipe for Super Oat Smoothie (GF) at https://www.theworktop.com/breakfast-brunch-recipes/super-sprouted-oat-smoothie/.